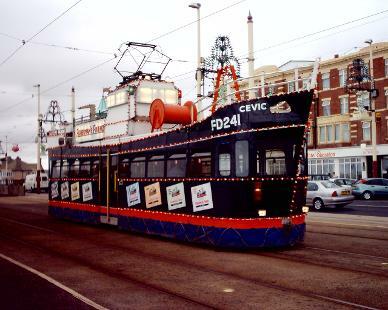 1998 was saw the Fleetwood Tramroad celebrate its centenary. In recognition of this, Marton 31, Toastrack 2 and Pantograph 167 were borrowed from Beamish in the case of Marton 31 and Crich in the case of Toastrack 2 and Pantograph 167, the latter pair had worked for more than 75 years on the tramroad between them. Events that took place included the first depot open day in 13 years, this included a line up of trams on the depot fan, including Toastrack 2, Pantograph 167, Coronation 660, Bolton 66 and Stockport 5. A number of trams operated a shuttle service on the long disused Foxhall track at the open day, including a twin car which managed to derail several times! On the day of the Tramroad Centenary, a procession of trams made its way to Fleetwood, including Rack 2, Box 40, Pantograph 167, Vanguard 619, Coronation 660, Balloon 700, Brush 631, Twincar 674+684 and Millenium Balloon 707. The most surprising development of the tram fleet during the 1990's happened in 1998 with the introduction of the first "Millennium" tram (707) at Tram Sunday 1998. The design of the tram was controversial with some enthusiasts as the tram lost its distinctive Balloon shape yet was in essence it was still a Balloon tram. The tram still required a crew of 3 to operate it, the tram retained the same interior layout as a balloon, the same controllers, braking systems, lighting and low voltage equipment that the then recently modified balloons had received and carried the same number of passengers. A further 3 Balloons have since been rebuilt in this style (709, 718 and 724). At the time the rebuild of 707 caused alot of adverse comment, especially when it was discovered that it has many unnecessary features such as air conditioning units and no opening window in the drivers cab, and even worse was to follow when 709 came into service, it had to get its air conditioning unit topped up with water by a fitter with a watering can at Manchester Square twice a day!!!!!! Needless to say, opening cab windows were installed soon afterwards. Also completed during 1998 was the refurbishment of Balloon 721. 721's refurbishment saw work done on the underframe, the new style of scoop lifeguards fitted, hopper windows replacing the half drop windows on both decks, the swingover seats on the bottom deck were replaced with bus seats. Although these changes were made, 721 kept its distinctive balloon shape, roof windows, top deck seating and bare bulb lighting on both decks. Rather disappointingly, despite the refurbishment, the all over advert carried by 721 for Mitchellin Tyres, whilst eye-catching, made use of contravision (which involves adverts covering the windows using material which apparently allows passengers to see out) and some top deck windows were also filled in meaning many passengers could not see out on large areas of the top deck. Unfortunately, the tram was used both during the illuminations and on illuminations tours meaning people sitting at the blocked off windows couldnt see the lights. After numerous complaints the filled in windows were restored in 2001 and the advert was finally removed in winter 2004. Centenary 642 was withdrawn for a major refurbishment in 1998 and made a return to service with newly shaped front ends in 1999. Over the following 8 years the remaining centenary cars would follow for 642 into the works for refurbishment. This did improve the performance of the trams however some of the faults remained such as howling sound that sounded like a baby crying when the tram was accelerating. By the time the refurbishments were complete, there was 4 different looks for the 8 strong class. Following 642: 641, 646, 643, 644, 647, 645 and 648 were refurbished. In August 1999 there was a serious derailment involving balloon 710. Whilst traveling between Cabin and St Stephen's Avenue, the track gave way beneath 710 causing the tram to derail. The tram remained marooned there for 5 days before it was removed, towed back to depot and the track repaired. During routine inspections in summer 1999, cracks were discovered in the bogies of some of the One Person Operated Trams. As a result of this, all 10 Centenary / Jubilee trams were withdrawn from service for a week at the start of the winter timetable to allow for repairs to take place. This resulted in heater fitted Brush Cars 625, 626, 627, 630 and 631 and Ex towing Railcoaches 679 and 680 operating on the Starr Gate - Fleetwood service (they managed this without a single breakdown) Other than a balloon car / Millennium car being used for the busy early morning school journeys on route 2, the Brush Cars/ Railcoaches managed a full turn out on all 7 service routes each day with the double decker on route 2 being swapped over for a single decker around 9.30am each day. The Heritage Fleet was bolstered in 2000 when Sheffield 513 arrived in Blackpool on Long term loan from Beamish and Standard 147, which had moved to America in 1966, was returned home for restoration in exchange for Boat 606 which went the opposite way. The tram was fully restored to original condition with many parts being salvaged from Engineering car 753. 147 finally returned to service in 2002. 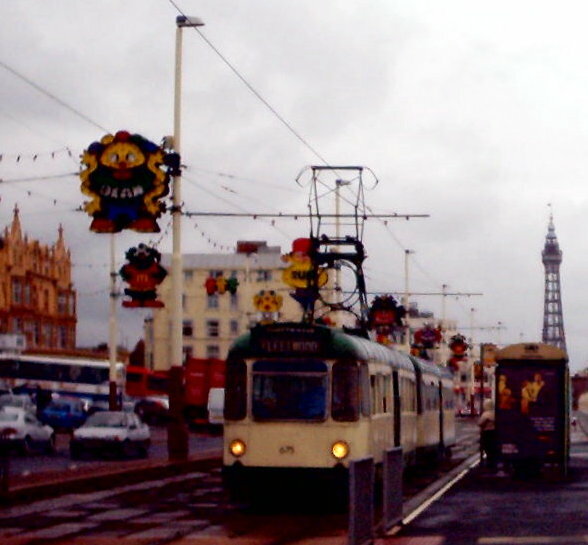 2000 also saw the first 'Tramless Sunday' as the staff of Blackpool Transport were all on strike on that day. 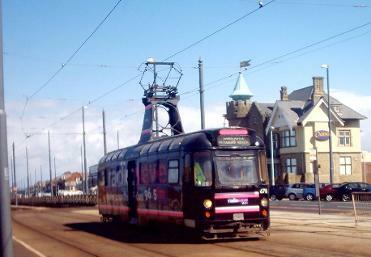 Between 2000 and 2001, the 'Rocket', the 'Western Train', the 'Hovertram' and the 'Frigate' were all withdrawn in need of rewiring and overhauls, meaning there was no illuminated trams available for service. Brush Railcoach 633 had been withdrawn from traffic in 1998 as it was in poor condition and in need on an overhaul. After being stripped and stored in the depot for two years, 633 was selected to become an illuminated tram and was rebuilt into the shape of an illuminated trawler, entering service in 2002. 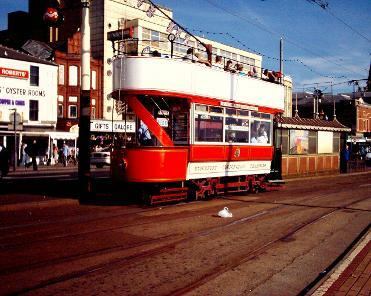 However the tram retained its original motors, controllers, bogies and the centre entrance doors from it's previous life. 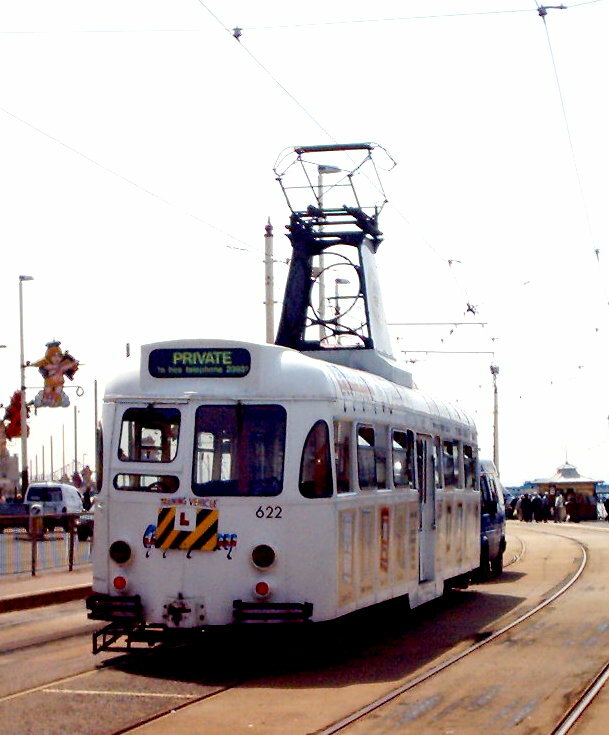 633 was a useful tram as it could be used as an ordinary service car all through the year as it had been fitted with heaters and high visibility headlights. In 2004, the illuminated Frigate also made a return to service following an almost complete rebuild, in fact the only remaining part of the original Frigate was the bow and the motors and trucks which originated from 736's previous life as pantograph 170. Funding from the Heritage Lottery Fund allowed the restoration of the Western Train to take place, this work commenced in 2007 with both engine and trailer stripped to a shell. The results were astonishing and the train returned to service during Summer 2009 and is still turning heads on the promenade. In Summer 2001, Coronation 304 returned to Blackpool for restoration, featuring on the Channel 4 program 'Salvage Squad'. Following 6 months of extensive work which included rebuilding 304's VAMBAC control gear, 304 made its first appearance on the prom since 1970 in January 2002. In July 2001, whilst returning to depot at night, Balloon 722 hit a sand drift on the prom. The sand drift was the result of unseasonably strong gale force winds. 722's front bogie derailed and the front half collided with an overhead mast and landing on the promenade road, smashing a window and causing panel damage in the process. It took until noon to remove 722 as the overhead mast and some of the illuminations had to be removed whilst one of 722's trucks had to be returned to depot by low loader whilst 722 was hauled to depotby a tow truck. 722 was repaired and returned to service a few weeks later in time for the start of the illuminations. From October 2002 and April 2004 double deck trams were banned from travelling further north than Thornton Gate due to deteriorating track between Thornton Gate and Ash Street and speed restrictions including 4 mile per hour limits were enforced in the worst affected areas, this resulted in the twin cars, Centenary Cars, the Brush Cars and Railcoaches operating the bulk of the summer service and Fleetwood Market specials. Severe late running on the main Fleetwood Service was common. The first day of the double decker ban saw all 7 twin cars and 2 Brush cars operated the Fleetwood service. It was the first time (apart from covering for breakdowns) that Twin Cars had been allocated to the timetabled service as their use was usually confined to specials. 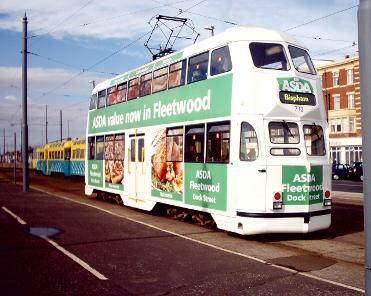 The first market day of the double decker ban was the first and last time that all 7 twin sets ran on the Fleetwood Service at the one time. Winter 2002 saw the tidy up and repaint of 3 twin sets (671 +681, 672+682 and 674+684) with a further 2 being repainted during 2003 and 2004. 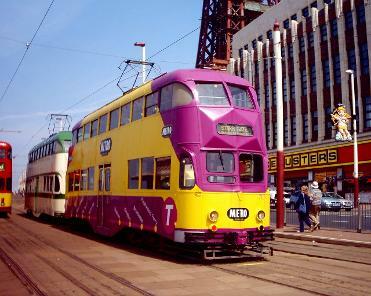 The twin cars became the first trams to appear in the new Metro Coastlines livery's, which were being painted on the buses at the same time. During 2003, the Brush Cars and railcoaches operated the main Fleetwood service for much of the early season before a split of 4 twins, 2 centenary and 2 brush cars operated the 8 Fleetwood service routes over for the summer months. 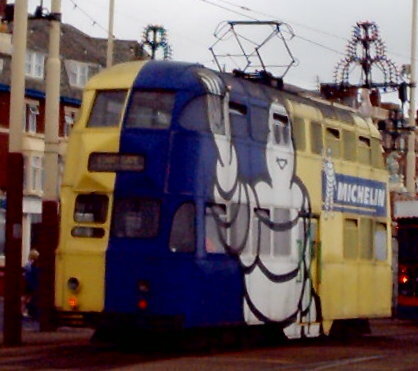 In 2003, ex works car 753 was donated to the Lancastrian Transport Trust to allow the tram to be restored. The fire damaged ex works car 753 was moved from the depot to the premises of the LTT in Brinwell Road for restoration back to its original form as Standard 143. The tram will feature open end balconies and open driving positions and will represent a variation of the Standard Car that isn't represented in preservation. 143 returned to Blackpool to join the heritage fleet in 2014 and it is hoped that work can be completed on 143 and that it will return to service in 2017. Due to the ban on Double Decker trams traveling north of Thornton Gate, use of Double Decker trams was reduced drastically for the majority of the 2003 season. Use of double deckers was mainly limited to those with valid adverts or those that had been refurbished. 704, 707, 709, 711, 718, 719, 720, 721, 722, 723, 726, 761 and 762 were the most used during this period. The 2003 season was also the last in service for Balloons 704, 716 and 717. 716 and 717 were withdrawn with underframe defects meaning that new underframes and overhauls were required before they could safely run again, whilst 704 was withdrawn after the season ended with roof problems . Before long all 3 trams lost their pantographs, and started to lose parts to keep their sister cars on the road. Within a year 704 has had most of its interior stripped out for parts for other trams, whilst 716 was being used as a store for spare parts including seats, roof panels and windows. Of the 3 trams, 717 was the lucky one as it is once again gracing the prom following a £110,000 1930's style restoration using many original parts coming from 704, 716, 717 its-self and from Balloon 720 which was in for a major overhaul at the same time as 717 . This superb restoration came as the result of a donation left in the will of an enthusiast called Richard Thorpe. A severe shortage of staff resulted in few specials running during 2003. Most nights there were no specials out at all after 8pm whilst the Cleveleys service very rarely operated. This meant that most nights only the 8 cars on the Fleetwood service were out and many irate passengers were left behind by packed to capacity trams (some times a Brush Car with a capacity of 48 seated and 6 standing) running at 20 minute intervals resulting in many complaints from unhappy passengers and holidaymakers. 700 repainted in wartime Green and Cream and some additional original features were installed during the repaint. 673+683 was also admitted to the paint shop during July to be repainted into Line 11 Light blue and yellow Metro Livery. The tram also received panel repairs and had it's leaky roof sorted. Track replacement took place of over the winters of 2002 and 2003 which saw closure of the line North of Thornton Gate between January and March in both years. 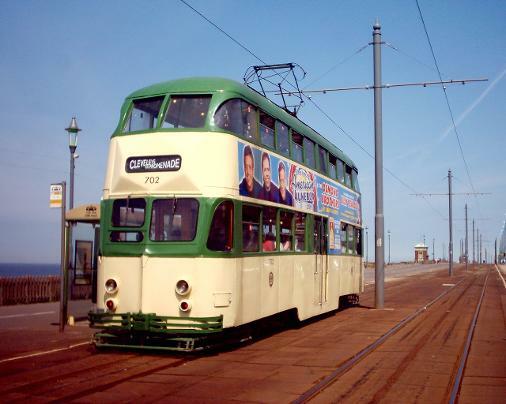 Double deckers returned to Fleetwood in 2004 with 726 being the first Balloon through to Fleetwood on Specials (701 was the last double decker to travel to Fleetwood prior to the ban) and 679 became the first service tram over the fully relaid track. On 13th March 2004, 644 was traveling north towards Gynn Square on an afternoon journey to Fleetwood when it hit a scaffolding pole placed in the grooved track, causing it to leave the track and hit the promenade wall and an electrical box. Luckily 644 didnt go through the wall but did knock some blocks over onto the middle walk. Luckily there were no serious injuries and no serious damage to the tram. The marks of where the tram's wheels dug into the tarmac remained until the track was replaced during Winter 2010. At the end of the 2004 season, following the 3rd extremely poor season in a row, it was realised that there was more trams avaiiable for service than was actually needed and a mass withdrawal or mothballing of trams took place. Balloons 703, 704, 716, 717 and 722. Brush Cars 621, 622, 623, 625, 627, 632, 634, 636 and 637. Boats 600, 602, 604, 605 and 607. 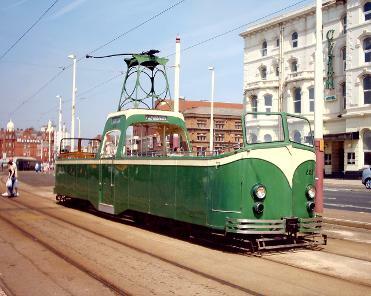 Balloon 702 was relegated to use as a reserve car during 2007 meaning it could only operate at times when there was a shortage of trams or busy times. 702 was only used a handful of times during 2007, 2008 and 2009. 702 departed the tramway in 2010. Balloon 703 was reinstated almost immediately, replacing 708 which was thought to be in a worse condition. 703 was finally withdrawn for good in June 2009. 703 was repainted during 2010 into Sunderland red and cream livery and moved to Beamish as Sunderland 101. 703 ran in this guise until 2014 when it was withdrawn in need of a major overhaul. 708 saw use as a snowplough car during the winter following withdrawal but was rarely ever needed. 708 was then transferred to storage at the East Lancashire Railway before ending up at the North East Land, Sea and Air Museum in Sunderland. 708 has returned to Rigby Road for storage. 722 was reinstated following a large number of advert contracts being commissioned and a shortage of suitable trams to carry them. 722 was withdrawn again following a collision with 711 at Miners Home in 2007 and was scrapped in 2009. More surprising was that 715 remained in service as it had been earmarked for withdrawal at the start of the 2004 season as and as it turned out, remained in service until November 2011, and after a period of outside storage, returned to service in 2015 as part of the heritage fleet. Brush Car 622 returned to service in April 2005 after Glyngarry, the company who had an all over advert on that particular tram prior to mothballing, deciding to renew their advertising contract. With there being a shortage of available double decker trams for a new advert, and a shortage of serviceable single deckers 622 had to be reactivated. 622 was withdrawn for good in November 2009. 623 also returned to use during 2005 originally just for driver training, but also saw some use in on specials. 623 was mothballed again during 2006 before making a return to service during 2007, when the tram returned to service in the livery the trams carried during the 2nd World War in celebration of 70 years in service for the Brush Cars. 623 was withdrawn in November 2009 departing the tramway in 2010. 625 was also named as a reserve car during 2005 for a return to service if required, however it wasn't required and has remained out of service. It is a surprise that 625 was even considered as a reserve car as it hardly saw any use in service during 2003 or 2004 and was thought to be in a poor condition. 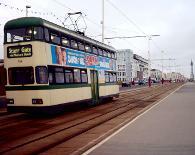 626, the first Brush Car to be extensively overhauled during the 1990's was withdrawn in 2008 as it had an expired advert before returning to service in 2010 in a half green / cream liveryonly to be sold and depart the tramway 4 months later. 627 made a one off comeback to make history and be the last of the current fleet to run to Fleetwood on Sunday 8th November 2009 when the tramway closed north of Ash Street for rebuilding. 632 returned to service in 2009 in connection with the 125th Anniversary as a tram of interest. 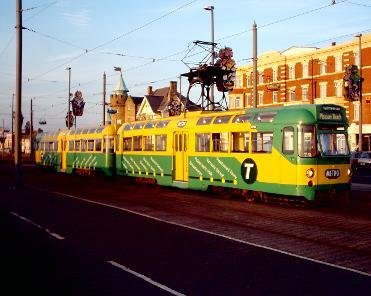 The tram was repainted into 1970's Green and cream complete with advertising roof boxes. 678 soldiered on until 2006 when it was withdrawn in need of a major overhaul. 680 was withdrawn in 2008 as it didnt have an advert, bringing to a close almost 50 years of service by the ex-towing railcoaches. 676+686 and 677+687 remained mothballed, and 677 was scrapped during 2007 to provide parts for the restoration of the Western Train Locomotive, 733. 619 returned to service for the first time since withdrawal in 2004 during 2008, the tram has gone to Heaton Park in Manchester on loan in 2010 with Manchester 765 being loaned to Blackpool during 2010 for the 125th Anniversary celebrations. From January 2005 right through until May, the point work and a portion of the track on Lytham Road was being relaid meaning that the only access to and from the promenade for all trams was via the rarely used track and junction at Foxhall. The track, which had rarely been used since the 1960's, was in poor condition. Trams had to travel along the track at walking pace and have their pantographs or trolleys tensioned by a shunter walking along side with a pole. In summer 2005, Balloon 713 returned to service following a major overhaul. Rather than receiving the Millennium style rebuild, retained the basic balloon shape and was given a similar refurbishment to the trams overhauled in the early - mid 1990's. October 2006 saw the withdrawal of two trams, Ex Towing Railcoach 678 was withdrawn in need of a major overhaul and stored, whilst Balloon 720 saw use as an unrefurbished balloon for the last time after it was withdrawn for a major refurbishment. 2006 was also the final time that 719 was seen in its unique Walls Ice Cream all over advert. 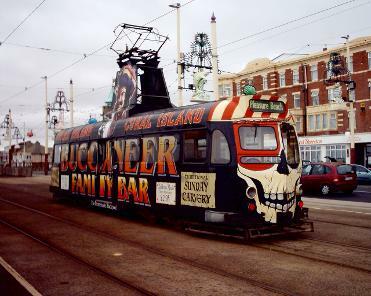 The tram was restored to a normal refurbished balloon, regaining its front upper deck windows and normal seating, returning to service in 2007 wearing an advert for the Infusion ride at the Pleasure Beach. Some traces of 719's past role remain to this day with some of the brightly coloured internal paneling remaining. The Western Train restoration project received its funding in late 2006 from the Heritage Lottery Fund and work finally began on the tram during early 2007. Between Winter 2006 and Easter 2007, the tramway was closed between Manchester Square and Starr Gate. This was to allow the renewal of a large area of track between Manchester Square and South Pier. Easter 2007 saw the return to service of Brush Car 623 in a recreation of the Wartime livery carried by the tram in the 1940's. This was to commemorate the 70th anniversary of the Brush Cars entering service. Balloon 710 operated for the last time in November 2007 when the tram was withdrawn in need of a major overhaul. Winter 2007 saw a major track renewal taking place, which required the closure of the full tramway until Easter 2008. The track was replaced between Manchester Square and Central Pier. At the same time, new crossovers and a new north/south link to Blundell Street at the Foxhall were installed. Elsewhere on the system, the Gynn Square crossover was removed as was the Manchester Square crossover. At Cabin the bypass loop was removed and replaced with a crossover slightly further to the north. The crossover and the rarely used spur at Pleasure Beach was removed, with the loops also being altered. Finally, at Little Bispham, the rarely used spur from the loop to the northbound track was removed. On 1st February 2008, an important announcement was made that would have an impact on the future of the tramway. Funding was to be given to allow the replacement of the remaining track that had still to be replaced, the renewal of the overhead wires, support poles and substations north of Thornton Gate, 16 low floor trams to be built, a new depot to house the new trams and the building of platforms at each of the stops throughout the system. The tramway reopened for the 2008 season on 21st March although only operating between Cabin and Starr Gate. The remainder of the line reopened on 26th April. On Tram Sunday 2008, Balloon 717 made its return to service following its restoration back to 1930's condition. A welcome return to service for Replica Vanguard 619 occurred just in time for the start of the Illuminations and the car proved popular both on specials and on Illuminations tours. Also during 2008, Railgrinder 752 was donated to Heaton Park Tramway in Manchester for preservation and departed during November whilst ex towing railcoach 679 was donated to the LTT, who had plans to restore the tram as Series 2 railcoach 279 with pointed ends, swingover seats and half drop windows. The tram was partly completed and was donated to the Heritage Trust and will one day be completed and will run on the tramway once more. Ex towing railcoach 680 was withdrawn at the end of the season as surplus to requirements. A shortage of servicable single decker trams over the early May Bank holiday in 2009 saw an unusual lineups on both the Fleetwood and Cleveleys service with Trawler 737 seeing use on Fleetwood service over the weekend, Balloon 721 operating top deck closed on the Cleveleys service vice a Brush Car and on Bank Holiday Monday, Standard 147 appeared on Cleveleys service! 736 had also seen use on the Fleetwood service in the week before the Bank Holiday! Balloon 703 was withdrawn from service in need of a major overhaul in June 2009, however as the tram retained the most features from the 1960's refurbishment of the Balloon Cars, it was donated to the LTT for preservation. Also picked by the LTT was Brush Car 632, which would also be restored. Returning to the tramway during 2009 was Brush Car 636. 636 returned from SET Derby where it was fitted with a prototype of a motor and truck at one end of the tram. 636 was seen on a daily basis in the early season shuttling up and down between Pleasure Beach and Starr Gate. 636 departed in Summer 2009 back to Derby where it remains having been sold to SET. Brush Car 634 was also sold into preservation and 679 departed for its rebuild into an original style railcoach. Balloon 722 was scrapped in October following its accident in 2007. The undoubted high point of 2009 was the return to service of the Western train after an absence of 10 years following a major restoration job funded by the Heritage Lottery Fund. In September 2009 the southern end of the tramway between Pleasure Beach and Starr Gate was closed to allow for a start to be made the building of the new depot at Starr Gate. Standard 147 became the final tram to depart from Starr Gate on September 6th. At the northern end, the section between Ash Street and Fleetwood closed on November 8th to allow the relaying of the track. Both Sections remained closed until 2012 when the upgrade was complete. Withdrawn Brush Car 627 made a one off return to service after 5 years in store to operate the final journey to Fleetwood Ferry prior to the tramway upgrade. The reason behind this was historical as the final journey on the North Station route in October 1963, a route which ran to Fleetwood Ferry was carried out by 627 (then numbered 290). In true Brush Car fashion, the tram performed faultlessly and you wouldn't have known this tram hadn't operated in 5 years. Although not known at the time, the end of the 2009 season signaled the end of the line for a large portion of the fleet. Most of the fleet were put up for sale / donation and subsequently sold, meaning that the number of trams available during the 2010 season was less than in previous years. Trams sold include 621, 622, 623, 625, 626, 627, 630, 632, 637, 678, 680, 671+681, 672+682, 673+683, 647+684, 675+685, 676+686, 687, 644, 648, 702, 703, 704, 708, 710, 712, 715, 716, 721, 726, 762, 619. First to leave Blackpool were Brush Car 623 and Balloon 702, which initially went to the Museum of Museums in Manchester whilst awaiting completion of the new depot at Heaton Park in Manchester. 623 went to Heaton Park in 2012, whilst 702 spent 3 years on open storage at the East Lancashire Railway in Bury before finally moving to Heaton Park in 2015. Balloon 712 was repainted into 1930's livery and then transported to Crich, where as 249, she is currently displayed as a static exhibit. Balloon 703 was repainted into Sunderland Red and Cream livery and moved to Beamish, where initially the tram was on loan, before later being bought by Beamish. 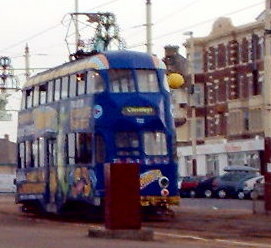 703 has since been donated back to Blackpool and should return sometime on 2017. Balloon 716 was bought by Ptarmigan Transport Solutions and was moved to their headquarters in Perth in July 2010. The company went into administration in 2015 and 716's last known location was a scrapyard in Kirkcaldy. 716's fate is currently unknown. During the Winter of 2009/10 the tramway closed again and another iconic tramway location changed forever when during the relay of the Central Prom between Central Pier and Victoria Street, the Tower bypass loop was removed and replaced with a crossover. 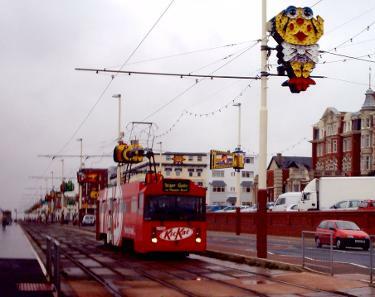 During the closure, the overhead wire was stolen between Thornton Gate and Ash Street, this caused the northern section to remain closed until June whilst the Pleasure Beach - Cleveleys section reopened at Easter. Due to a shortage of trams, some of the sold trams made a return to service during 2010, with 671+681, 673+683 and 726 returning to service. 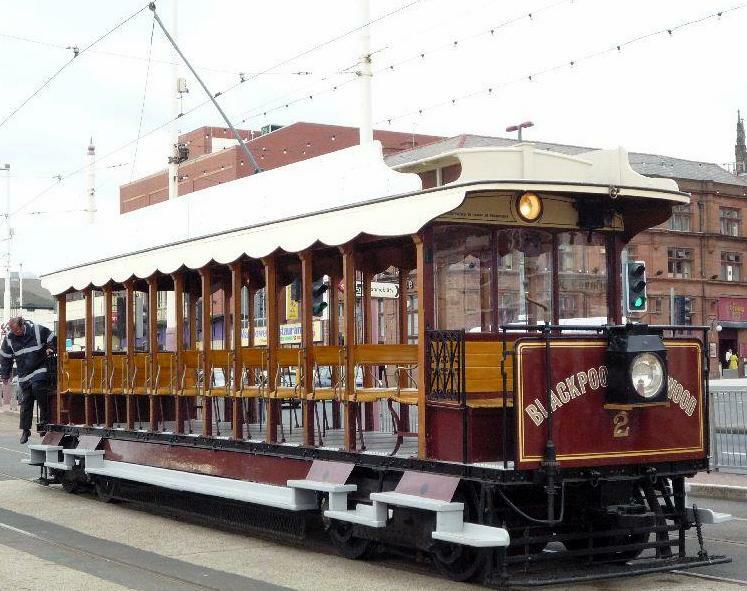 Visiting trams for the 125th Anniversary were Blackpool and Fleetwood 2 , Pantograph 167, Marton 31, Birkenhead 762, Manchester 765, OMO 8 and Oporto 273. 273 couldn't operate as the tram dewired and derailed at Pleasure Beach, whilst Standard 143 and 279 werent ready for use, whilst Johannesburgh 60 and Standard 40 couldn't make it as low hanging tree branches near Crich caused damage to 60 when traveling to Blackpool. Once again the tramway closed from November - Easter during 2010 / 2011 with more track relaying taking place. The main work carried out involved relaying the track at North Pier resulting in the track layout changing, the relaying of the street track at the Metropole closer to the pavement and separating the track from the road, eradicating a pinch point between the tramway and road. Also replaced was the last section of paved track between the Metropole and Gynn Square. Work was also carried out between Anchorsholme road crossing on the edge of Cleveleys to just north of Thornton Gate, whilst platforms were built at Key locations along the prom. The final year in service for the traditional fleet began on Good Friday however only between Pleasure Beach and North Pier with the line north expected to be opened back up in stages. Very few trams were available for service at this point although very few trams were actually needed. By May 2nd 2011 only 147, 600, 632, 646, 648, 711, 715, 719, 723, 761 and 762 had seen any use. For of the early season, a 30 minute evening service requiring only 2 trams was in operation. However, during the Saturday night of the late May Bank Holiday, following a breakdown of one of the trams on the evening service, which was not replaced, only 1 tram (723) was used on service from 7pm onwards, giving an hourly service. 641 appeared to be withdrawn sometime around June / July, whilst 630 was withdrawn after service on the 30th October to be repainted prior to its transfer to Crich on 21st December. 762 saw its last use on 5th November when it was prepared for its move to Crich and departed on 7th November. 723 also saw its last use on 5th November. 642, 643, 644, 645, 646, 647, 648, 631, 632 and 715, 672+682, 675+685 were all withdrawn after service on 6th November. That final day also featured the traditional Centenary Car breakdown, when 645 failed at Bispham and had to be towed to depot. 643 which had been thought to have already been withdrawn having not been used for 2-3 months was quickly reactivated using parts from 645. Whilst the evening saw a surprise in 672+682 becoming the last twin car set to operate on service after 711 developed a fault and needed to be replaced. 707 brought the service on the traditional tramway's life to an end when it operated the last service.